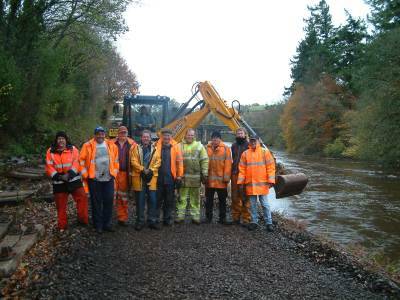 2009 Winter PWay Works programme gets into full swing. 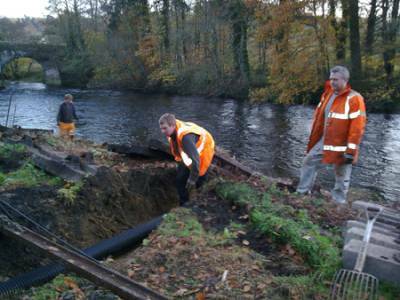 With a shortish section of 288 sleepers relaid near Hood Bridge in November as a warm-up effort, the South Devon Railway's PW gang are now tackling the length from Buckfastleigh Station throat to Nursery Pool bridge, a length of just under 1000 sleepers. 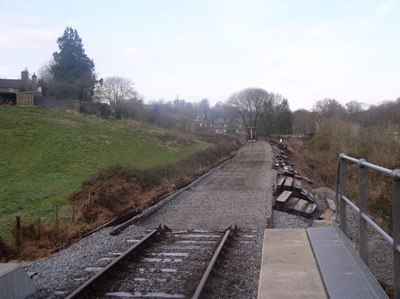 Wooden sleepers are the preferred option along this section which includes the small overbridge close to the station under which it is essential to maintain the necessary clearance. 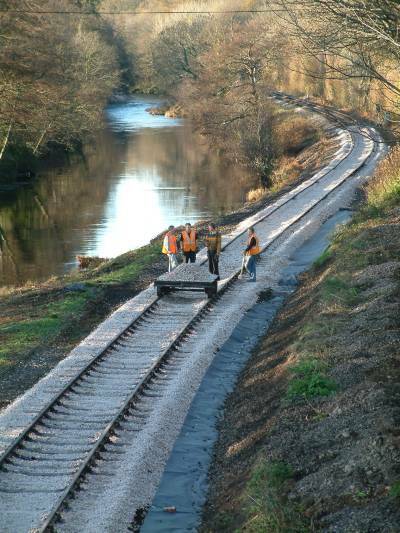 Concrete sleepers are 1" thicker than wooden sleepers and the additional space cannot be spared. 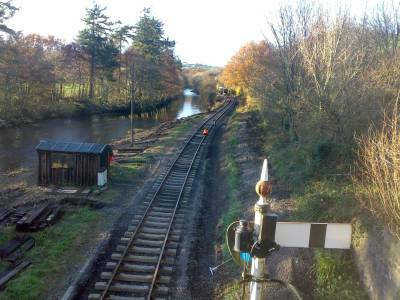 Unusually the line at this point has been laid over the Buckfastleigh main sewer pipe which was placed directly under the track many years ago. 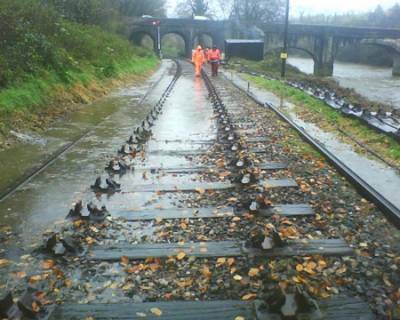 Manhole covers and inspection chambers do not allow any chance of lowering the track to give more clearance. 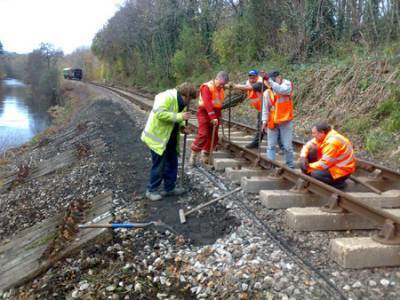 This relay will eliminate the last large section of old wooden sleepers that have existed from BR days. 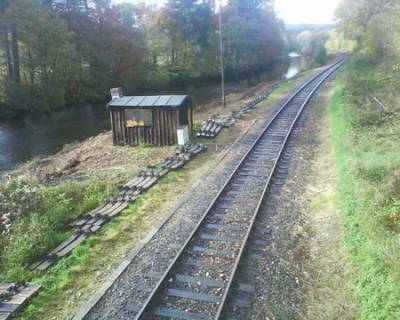 Over the intervening years the patch has been heavily spot resleepered, but even so some 50% had chairs date from 1958, just before the line closed to BR passenger trains. 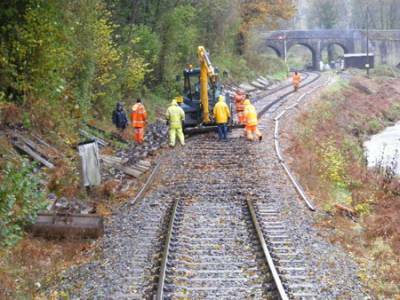 Apart from this section the only wooden sleepers on the branch will now be in the three stations. 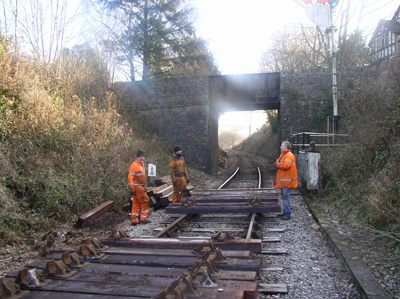 The PW gang will then move on to deal with changing point timbers around the station yard at Buckfastleigh after the current job is completed. Volunteers are always welcome to join in. The usual winter gang consists of four paid members of staff - including the Cafe manager! Up to thirteen members were at work last weekend preparing for the main relay. 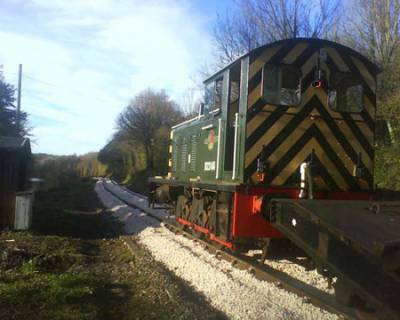 The Midland Railway Centre tamper is being contracted to deal with the winter's new works after these have been spread with new ballast from Stoneycombe Quarry - the quarry from which vast quantities of the Western Region used to receive their supplies. 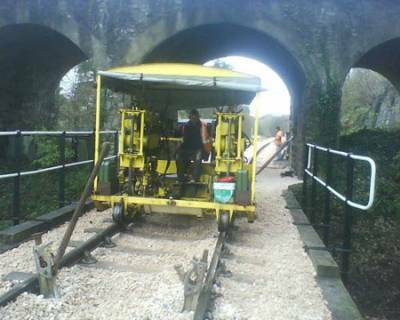 Now the main line railway uses harder material from the likes of Meldon Quarry however the material from Stoneycombe is quite suitable for a 25mph branch and benefits from being 'just up the road'. 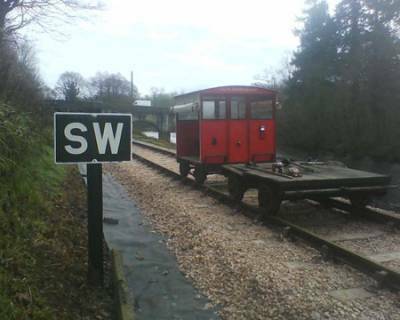 A pity its not still rail connected and we could send our own 38XX loco up Dainton to collect a few Dogfish loads!! 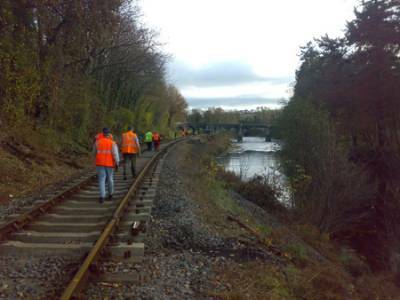 The original track under Hood Bridge Track with rails removed - note inclement conditions!